Henry Moore’s sculptures have made the transition from private gallery to art museum to general public appreciation with such success that his work has become both instantly recognisable and synonymous with British Modern art. The very large works that we have become accustomed to seeing at Kew Gardens, London, in the Yorkshire Sculpture Park and in city squares nationwide are impressive and impactful, but in fact it is Moore’s table-top size pieces that have been described as having a ‘delicacy and emotional resonance that is missing in the big bronzes’ (Jane Ure-Smith for the Financial Times Arts supplement, 19 August 2011). Henry Spencer Moore was an English sculptor and artist. He was best known for his abstract monumental bronze sculptures which are located around the world as public works of art. His forms are usually abstractions of the human figure, typically depicting mother-and-child or reclining figures. 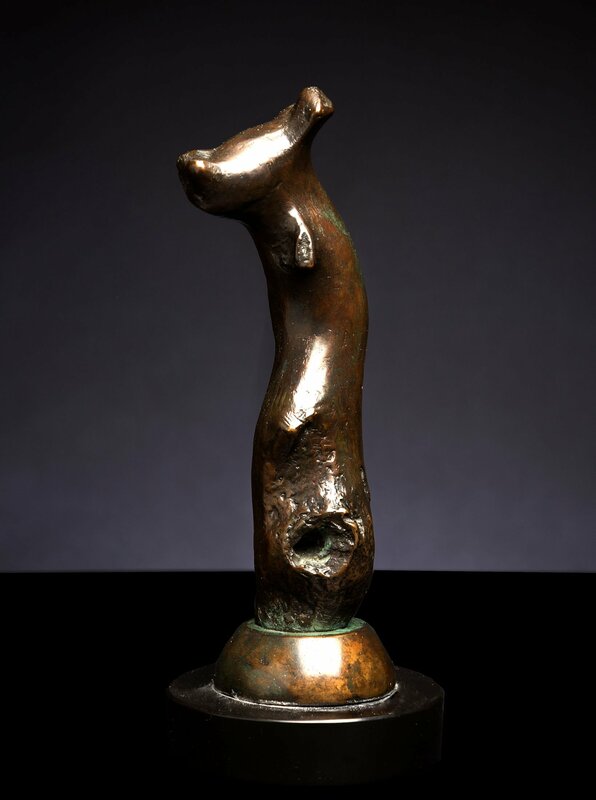 Moore’s works are usually suggestive of the female body, apart from a phase in the 1950s when he sculpted family groups. His forms are generally pierced or contain hollow spaces. Many interpreters liken the undulating form of his reclining figures to the landscape and hills of his birthplace, Yorkshire. His ability in later life to fulfill large-scale commissions made him exceptionally wealthy. Yet he lived frugally and most of the money he earned went towards endowing the Henry Moore Foundation, which continues to support education and promotion of the arts.